Strawberry Festivals in 2019: Where, When and More to Find a Strawberry Festival Near You! Looking for a strawberry festival in April 2019? There is no other listing as complete and current as this list, just updated! 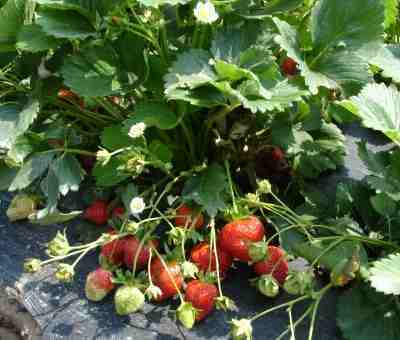 All the strawberry festivals in the US, Canada and Britain we can find are listed on this page! If you love strawberries, look for a festival near you below! And I'm always looking for more strawberry festivals! Please write me, if you know of any to add! I update the dates as soon as the festivals publish their information, but you can always click on the links (usually the name of the festival) to see the current information on the festival's own website. I update this list every year, but still Always click on the links (the blue, underlined name of the each festival) to confirm this year's dates on the website for each festival. If they don't have a website, call the phone number provided, but ALWAYS CONFIRM THIS YEAR'S DATES AND TIMES BY EITHER VIEWING THEIR WEBSITE OR CALLING. Bald Knob Strawberry HomeFest - Mother's Day weekend, Thursday night to Saturday night. See this page for California Strawberry festivals - there are too many to list here. Glendwood Springs, CO. Email: [email protected]. The three day festival includes a juried Artisan's Fair, top notch family entertainment on the FamilyFest Stage and, of course, free strawberries and ice cream. Strawberry Days sums up the friendly character of Glenwood Springs and celebrates family and community. The Strawberry Days carnival will return with a new Ferris wheel and more kids rides! The three day festival includes a juried Artisan's Fair, top notch family entertainment on the FamilyFest Stage and, of course, free strawberries and ice cream. Strawberry Days sums up the friendly character of Glenwood Springs and celebrates family and community. The Main Stage music for Strawberry Days will be a mix of country rockabilly and soul. Come down and rock the country! Strawberry Days is Colorado's oldest civic festival and attracts thousands of locals and visitors alike. There's no doubt been a big change since those strawberry picnics over a century ago, but, the essence of Strawberry Days remains the same - to have fun, meet old friends and make new ones. The 110th Annual Strawberry Days festival takes place mid-June at Sayre (Strawberry) Park. See this page for Connecticut Strawberry festivals - there are too many to list here. 1919 Allabands Mill Road, Wyoming, DE 19934. Phone: 302-697-2141. Free Live Bluegrass Music from Chester River Runoff -Hay Rides -U-pick Strawberries - Special bucket price -Pony Rides -Face Painting -Balloon Art Good Eats including: -Fresh food by competitive BBQ team "BBQ Grills" featuring a special Strawberry BBQ sauce -Build Your Own Strawberry Sundaes -Strawberry Shortcake -Strawberry Pie -Strawberry Smoothies -Strawberry Ice Cream -Chocolate Covered Strawberries Bring the whole family out for a Berry Fun Time! Wagon Rides, U-pick Strawberries - Bucket price special! Pony Rides Also Face Painting, Balloon Art, Forrest Avenue Animal Hospital - Free Stuffed Animal Clinic. Bring your well loved (worn out) stuffed friends for on site mending. See this page for Florida Strawberry festivals - there are too many to list here. Downtown Reynolds, GA. Phone: 478-847-5301. Open: see their website for this year's date and times. Directions: Map of Reynolds, GA. It is FREE to get in. This festival is Handicapped accessible. They will have a Teddy Bear Parade (which begins at 10:00 am), a Grand Parade, Arts and Crafts, a Car / Truck Show, Photography Show, Lawn Mower Races, a Cook-off, an Old Book Sale, and a Main Street Stage. You can find much more specific information about what is going on with the Strawberry Festival on the "Press" Page. See this page for Illinois Strawberry festivals - there are too many to list here. See this page for Indiana Strawberry festivals - there are too many to list here. Farmington, IA. Phone: (319) 878-3866. Email [email protected].The Farmington Strawberry Festival is held each year the 2nd Full Weekend in June, with activities beginning on Friday and running through Sunday. The Festival is sponsored by the Farmington Arts Council. Every year FREE strawberries and ice cream are served Saturday and Sunday, from 2-4 pm, courtesy of the Farmington Arts Council. The strawberry and ice cream tent is set up in the heart of downtown, behind State Central Bank. Both weekend days you will find kid games, food stands, vendors of all kinds, bingo, cake walks, and live entertainment. There is FUN for all ages!. Also on Sunday, from Noon to 4pm at the corner of 2nd and Elm will be The Kenny Hamberg Memorial Car Show. Registration is from 8am to Noon. Free T-Shirt for each entrant. Vendors of all kinds provide their services and sell their wares at the Strawberry Festival. Crafts, antiques, collectibles, games, and food booths are just a few of the things you will find lining the streets of the downtown area on these three days in June. The strawberry and ice cream tent will be set up downtown, across from John's Food Center. Vendors of all kinds provide their services and sell their wares at the Strawberry Festival. Crafts, antiques, collectibles, games, and food booths are just a few of the things you will find lining the streets of the downtown area on these two days in June. More information: Entertainment schedule, Where to Eat, Car Show, Photo Gallery..
Long Grove, Iowa. Area strawberry farmers sell strawberries, other produce and crafts at merchant booths throughout town. Strawberry shortcake, ice cream and other food is available throughout the day. Other activities include a parade, the Strawberry Stampede youth fun/competitive fitness footraces, a re-enactment of a 1921 bank robbery (in which the two suspects were killed) and numerous other activities. A street dance takes place on Saturday evening, the day before the festival, as the unofficial kick-off to the event. 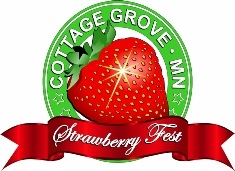 The Strawberry Stampede is a youth road race (ages 0-14) 1/4 mile & 1 mile events, held in conjunction with the annual Long Grove Strawberry Festival, Long Grove, Iowa, the 2nd Sunday every June. Strawberry Point Strawberry Days - mid-June - see their website for this year's dates; in 2019, on June 7th, 8th and 9th. Strawberry Point, IA. Friday to Sunday, many events and activities,m a carnival - see their website for much more information. 23401 Prairie Star Parkway, Lenexa, Kansas. The Strawberry Festival provides fun for the entire family and features: Strawberry shortcake, Fun for kids - giant slide, moonwalk and games, Lenexa Police, Fire and Ambulance, Blood pressure screenings, Chair massages, Information from Shawnee Mission Health experts. Chance to win prizes! Adairville , KY 42202. Phone: 270-772-2175. Email: [email protected]. 72nd Annual Adairville Strawberry Festival .The Strawberry Festival features a special guest to ride at the head of the parade, bands, floats, beauty queens, area officials, clowns and much more fun stuff for the big and little kids. As the parade winds around the center of town, the aroma of great food fills the morning air. As you look at the park, one will see a glimpse of small town America with families having fun and little ones with ice cream on their chins. Each and all are excited about the days event and a chance to get out and have a fun day. The Strawberry Festival began in 1947 and is one of the longest continually running festivals in the state. The money raised has helped in purchasing fire trucks, playground equipment, beautification of the downtown park square and many other things. It is organized by the Adairville South Logan Chamber of Commerce members and volunteers. Downtown, Beaver Dam, KY. The Strawberry Festival is held each year during Memorial Day weekend. The festival consists of several activities such as: beauty pageants, car show, tractor show, motorcycle show, 5k run, arts & crafts, vendors, hot dog eating contest, carnival rides, Native American cooking, gospel singing, quilt show, pet show, Veterans Program, parade and much more. Come celebrate the Annual Strawberry Festival in downtown Beaver Dam. Enjoy music, rides, food, pageants and this year Sharks! 600 Woodburn Allen Springs Road, Woodburn, Kentucky 42170. Phone: (270) 529-5221. The event along Main Street in downtown Woodburn begins at 8 a.m. on Friday and Saturdays and features antiques, collectibles, crafts, strawberries, barbeque and more. The communities of Woodburn and Smiths Grove shipped more strawberries than any other place in the country during the early 1900's. The Woodburn Strawberry Festival celebrates this heritage and the spirit of the community. Admission and vendor setup are both free. Ponchatoula, LA. The Annual strawberry festival has entertainment, games, races, and food. The 49th Annual Ponchatoula Strawberry Festival will be held in 2020 in mid April in Memorial Park in historic and beautiful Ponchatoula, Louisiana. The Ponchatoula Strawberry Festival is a FREE family friendly outdoor festival, filled with lots of great food, strawberries, entertainment, and fun for people of all ages to enjoy! With two music stages and food booths supporting local non-profit organizations, the festival grounds are the place to spend the weekend. We look forward to seeing you at the Ponchatoula Strawberry Festival, where we promise you will have a BERRY good time! Downtown Kimmswick, MO. Jefferson County. Phone: 636-464-7407. Email: [email protected]. Come to our small community and shop at our more than 30 unique shops, eat any of our four restaurants with plenty of outdoor sitting areas. The streets and grass fields will be lined with hundreds of homemade craft, direct sInquiry from a visitor to www.PickYourOwn.org/strawberryfestivals.phpales, corporate sponsor and food booths. There is something for everyone! Crafters and food vendors line the streets offering Strawberry Shortcake, Chocolate Covered Strawberries, and Strawberry Cheesecake and more. There is a petting zoo, train rides, pony rides, bounce houses, small children's rides, games for the kids, face painters, and caricature artists. The town also has an Apple Butter Festival in October. 1500 N. Liberty St. Independence, MO 64050. Phone: (816) 229-8293. Free admission to grounds; Mansion Tour: (2018 prices) Adults $6.00 | Children $3.0. A hundred craft and antique dealers will be set up around the Mansion. The Vaile Society will be selling Strawberry Treats! Downtown Billings Strawberry Festival - Saturday, mid June (check their website for this year's dates) JUNE 13, 2015! Billings, Montana. Click here for directions. Great Arts & Crafts Vendors - Pancake Breakfast - Children's Activity Area Free Entertainment - Great Food and Strawberry Treats. Located in the streets of downtown Billings, the Strawberry Festival is a long-time cherished community event that opens the summer season on the second Saturday in June. In the heart of our urban center, experience rich diversity in arts and crafts, fresh produce and strawberries, the scents of food-truck fare from Asian to BBQ , live street entertainment, and a 60′ strawberry shortcake created by the Chefs and Cooks of Montana. With an interactive children's area including free crafts and activities for all ages, this draws people throughout the northwest region to Downtown Billings under Skypoint at 2nd Ave N. and Broadway. Florence, MT. Contact KC Thompson at Phone: 406-273-7780. Directions: south of Missoula on Hwy 93, in the beautiful Bitterroot Valley. Saturday, Arts & Crafts vendors, strawberry desserts galore (whole or by the slice), plus the featured treat, our homemade strawberry shortcake, cake walk, footlong hotdogs, hamburgers, games for the kids as well as volleyball, bocce ball, horseshoes and LIVE music. Come for a day of FUN. 5995 G Road, Nebraska City, NE 68410. Phone: 402-873-5293. Email: [email protected]. The Gardens Park, 10401 Garden Park Drive, Las Vegas, Nevada, 89135. Phone: 702-341-5500. Summerlin residents are invited to celebrate the strawberry season at the Summerlin Strawberry Festival and Farmers Market on Thursday, May 3 from 4 to 8 p.m. Eat it. Drink it. Bake it. Toss it. Roll it. Run with it. Sing about it. You name it, we will do it, all with strawberries in mind! There will be various contests each with a strawberry theme, including a strawberry toss, shortcake eating challenge, and a relay race. Attendees will also enjoy a bounce house, face painter, and lively tunes that are sure to get you dancing to a strawberry-beat. So mark your calendars and plan to attend the Summerlin Strawberry Festival at the Gardens Park Farmers Market. See this page for New Hampshire Strawberry festivals - there are too many to list here. See this page for New Jersey Strawberry festivals - there are too many to list here. See this page for New York Strawberry festivals - there are too many to list here. See this page for North Carolina Strawberry festivals - there are too many to list here. See this page for Ohio Strawberry festivals - there are too many to list here. Stilwell, OK. The festival has been around since 1948 and is a huge event in the town of Stilwell. In past years, the Festival parade started at 10:00 am and proceeded down Main Street with the crowning of Stilwell's newly chosen Strawberry Festival Queen following. At 2:00 there was an auction of the finest Stilwell strawberries. The traditional serving of free cake and ice cream, with Stilwell strawberries begins at 3:00 pm Many vendors come and showcase their talents and craftsmanship during the festival. If anyone visiting this site is interested in setting up a stand, just choose your area of interest and all of the information available will be listed. Come join in the fun in STILWELL, OKLAHOMA. Smith's Castle Strawberry Festival - (check their website for this year's dates) Noon-4:00 p.m.
55 Richard Smith Drive, North Kingstown, R.I. Phone: 401-294-3521. Email: [email protected]. Enjoy Smith's Castle's strawberry shortcake and enjoy a day filled with fun family entertainment. See this page for South Carolina Strawberry festivals - there are too many to list here. Somerset Court, 4001 Derby Lane, Rapid City, SD 57701. 605-718-3600. Email: [email protected]. See this page for Vermont Strawberry festivals - there are too many to list here. See this page for Virginia Strawberry festivals - there are too many to list here. Rock Creek Church Rd & Webster St, Washington, DC 20011. Phone: 202-726-2080. Email: [email protected]. St. Paul's erects tents to cover the food (including, of course, fresh strawberries and strawberry shortcake) and the items offered for sale-baked goods, hand-crafted items, jewelry, plants, and more. Join us for a day filled with activities for everyone that brings together the community while enjoying food, games, laughter, music and much more as we kick off to summer. Come show your community support and join us for the Strawberry Festival. For more information, please call or email. See this page for Washington State Strawberry festivals - there are too many to list here. 152 Nessly Road. Route 2 New Cumberland , WV. Event date: 11am- 3pm on June 21, 2014, Saturday. Click here for this year's Google search. Buckhannon, W.Va. The festival is a unique, traditional celebration to promote the harvest of the strawberry. A week-long event that is highlighted by three days of parades that echo down Strawberry Lane with high school bands marching and competing for up to $100,000 in scholarships at West Virginia Wesleyan College. Enthusiastic volunteers provide good, family style entertainment that offers exciting educational and cultural events for everyone. Children and adults alike will enjoy the fun and thrills of the carnival. Take a stroll through the arts and craft exhibits, quilt show, or the photography show. Enjoy the variety of Main Street and Courthouse entertainment or stop by the band competition, car show, strawberry auction, or your favorite sporting event. You won't want to miss the huge block parties of entertainment on Main Street on Friday and Saturday nights. See this page for Wisconsin Strawberry festivals - there are too many to list here. Cambridge, England. Contact the fair. Email: [email protected]. Phone: Strawberry Fair Hotline on 01223 560160. A local festival of music, entertainments, arts and crafts that takes place in Cambridge on Midsummer Common each year. Over its 30 plus year history, Strawberry Fair has evolved into one of the largest, free, open-air festivals of its kind in the country. And, believe it or not, it is completely free to attend! !